When Erin Canning landed a job in her field, after graduating from Mount Allison University with a B.A. in art history and anthropology, she considered herself one of the lucky ones. Entry-level employment in the art world, whether commercial or non-profit, is difficult to come by. Instead, she headed back to school to try to solve some of the problems she had encountered in her four years on the job in the art world, including the fact that its information systems weren’t meeting its needs. 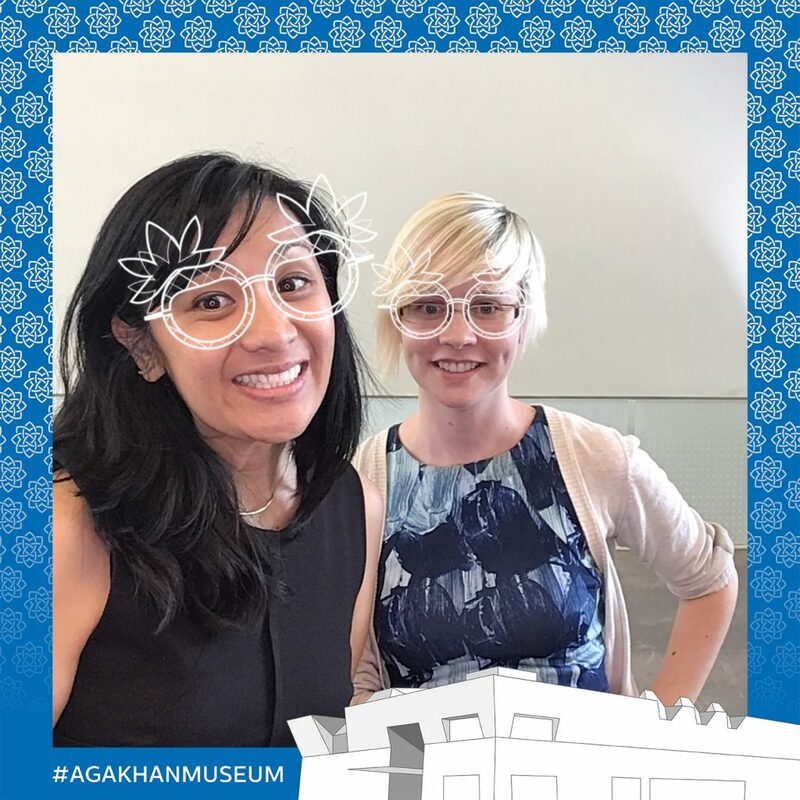 Erin Canning (right), with Marketing Manager Sahar Bhaloo, testing out the functionality of a photo booth installed in the main entrance of the Aga Khan Museum. The photo booth was a digital project that ran at the Museum over Summer 2018. While working, Canning had seen software systems that were overwhelmingly large, difficult to figure out, and one size fits all. There was a steep learning curve that was difficult for users without tech backgrounds to master. Information was also too “siloed,” causing difficulties associating client, artist and inventory information, for example. If a gallery received a new work by an old client’s favourite artist, there might not even be automatic notification. In 2015, Canning enrolled at the Faculty of Information in concurrent Master of Information and Master of Museum Studies programs. Her specialty was Information Systems Design and User Experience Design. Earlier this year with graduation rolling around, Canning was still facing uncertainty about her job future. To keep in the loop, she applied successfully to speak at various conferences about her thesis work on building information systems for art museums. Then, in the week leading up to her thesis defence, Canning was offered the position of Digital Platform Administrator at Toronto’s Aga Khan Museum. It was a permanent fulltime position that she originally discovered on an online job board. “I was over the moon,” she said. Coincidentally, Canning’s boss, Hussein Rajabali, is another Faculty of Information Class of 2018 graduate. His studies were in knowledge and information management with a focus on identity, privacy and security. He and Canning never met during their time at the Faculty, but he was able to assess her skill set and wanted someone who knew the museum world.